Theresa May is back in action at the Tory party conference this week and is probably now running through her lines as she prepares her keynote speech. The eyes of the many will be on the Prime Minister as she takes to the podium on Wednesday. If there was ever a time to pull a couple of aces out of her sleeve and grab the headlines then this is the week to do it. Calling a November General Election would certainly steal the fire, although it is far more likely that she will spend a torrid few days fending off more threats to her leadership. So here’s hoping (for her sake) that she can summon the sort of Theresa May speech she is desperately in need of to set her on track after recent setbacks. By all accounts, the British PM is sincere, loyal and conscientious – three traits that any electorate would want in a politician representing their interests. Unfortunately, she frequently fails to transmit these positive characteristics when speaking in public. Unable to barnstorm, let alone tub-thump, Mrs May isn’t a natural at public speaking. She hovers between mild mannered vicar’s daughter (not that all daughters of vicars are necessarily mild-mannered or even need to be) and tepid-to-cold Maybot mode. After a bruising at the hands of EU leaders in Salzburg a couple of weeks ago she called for respect, but unfortunately her tone was more of a pulpit sermon shudder than the sabre rattle it needed to be. So as she and her speech writers seek to rustle up the words to inspire the Party faithful, the nation, the EU and the rest of the world – no pressure then – let’s take a look at two speeches that didn’t work… and two that did! 2017 General Election Speech Following the debacle of the 2017 General Election. Despite the Tory blue statement suit, she’s like a rabbit in the headlights in this Downing Street speech. Confidence sapped it’s as if she wants to get off the podium as quick as she can. Over reliant on her notes, her words sound hollow and this time, the whir of this helicopter seems to be a metaphor for the PM’s uninspiring drone. 2017 Conference: Theresa May Speech A Theresa May speech so painful, that even the thought of reviewing it again brings me out in hives! No speaker, let alone the leader of a country, should have to go through what she went through that day. A textbook speech, and not in a good way, to be remembered for all the wrong reasons… for many, many years to come. 2002 Nasty Party speech Conservative Party Conference 2002, Bournemouth. Mrs May stunned delegates, and grabbed the headlines with the following lines; “There’s a lot we need to do in this party of ours. Our base is too narrow and so, occasionally, are our sympathies. You know what some people call us? 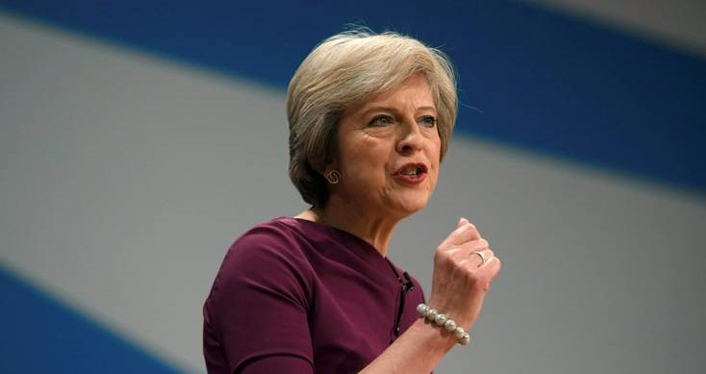 The nasty party.” A daring Theresa May speech, delivered with confidence, and that same steel was in evidence at the Tory’s 2016 conference speech when she invoked the same phrase but flipped it to talk about the Labour Party (cue loud applause). 2016 Theresa May Speech: First As Prime Minister Contrast this with the General Election speech. The flashbulbs are pinging, a helicopter’s whirring overhead, protesters’ heckles can be heard… and yet in swirl of gravitas you can almost hear a pin drop. An assured Theresa May speech, punctuated by colourful rhetoric. What shone through in both words and movement was the confidence of having belief in her abilities.